I wrote "Shaggy Dogs" in 1996 and it was published in the Spring issue of the SCBCC magazine in 1997. Following it is a related article, "Double Standards" that I wrote for the BCC of America in 1998. It was also published in the BCC magazine in November of the same year. At the bottom of the page there are a couple of earlier items in similar vein, dating back to the early 1980s. "Since with a dog expression is everything, surely the closest affinity is with the Scottish Deerhound? Both have that dreamy, wistful, far-away gaze. A gentleness. And yet a nobility which lifts them out of the net they might otherwise fall into as mere shaggy dogs." I think that this beautifully describes the difference between "shaggy dogs" ( which Beardies should certainly be ) and "mere shaggy dogs" ( which the best Beardies are certainly not ). 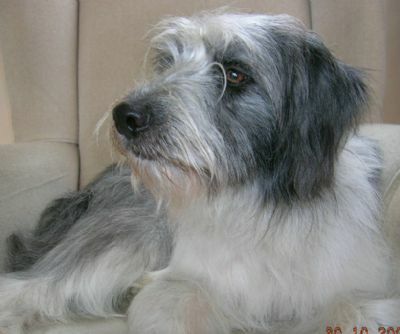 Since the word "shaggy" appears twice in the Beardie Breed Standard to describe the desired coat type, it is interesting to note its dictionary definition ( Chambers ) : "......having long, rough, coarse hair; unkempt, rugged." It is also interesting to note that the word is said to derive from the Old Norse 'skegg' - meaning 'beard'! My special favourite was Benjie who, for me, perfectly illustrated the Breed Standard. He also had that special presence described by Stanley Dangerfield. Benjie passed on this quality to his son, Heathermead Handsome, who was my own first Beardie, bought as a puppy in 1962. Handsome's career began with wins in obedience when he was barely six months old and he went on to become a show champion in 1965, before turning to working trials and becoming one of the very first Beardies to gain the BCC Senior Working Test Award. All of my present Brambledales are descended from him and his versatility is a quality I strive to preserve. But reading Mr Dangerfield's words today, I feel terribly sad that many of today's judges seem to have lost sight of the breed character that he described. The handsome but rugged working dog so clearly described in the Breed Standard has been gradually replaced by an increasingly over-coated, glamourized super-model whose best friend is his hairdresser. Sadly the trend is self-perpetuating because the image that the breed presents at shows today appeals to people who want just those features that might be appropriate to the Maltese but are totally foreign to the Beardie. The number of Beardies competing at shows is high compared to the number registered - yet more evidence that this is becoming essentially a show breed. In the early days potential puppy buyers had to decide whether they had the energy and enthusiasm to cope with an active, intelligent dog who needed plenty of exercise and something to occupy his mind. Today the main requirement is the ability to cope with the coat. When judging, I find it evident that most exhibitors would rather groom than walk. The modern show Beardie is more often soft and flabby than lean and muscular and this inevitably shows in poor movement. The Breed Standard makes perfectly clear that a long, flowing coat is entirely wrong and I believe that it should be regarded as a major fault. An over-coated dog can neither "show plenty of daylight under the body" nor the "bright enquiring expression [which] is a distinctive feature of the breed. "How many modern show winners have "..eyebrows arched up and forward but not so long as to obscure the eyes"? More often the eyes are only seen at all because of the handler's constant brushing back of the flowing hair - not at all what the Standard requires. I would like to ban brushes and combs from the ring. And what of the Standard's detailed description of the "typical beard" with hair "just to cover the lips" ?!? 1) Selective breeding for correct coat. 2) An end to coat-care regimes designed to preserve as much coat as possible. Rigorous combing and plenty of country walks could help to remove the excess coat and result in happier, leaner, fitter Beardies - and owners. The skill of British breeders is acknowledged throughout the world. Other countries look to us for a lead. What about a "Campaign for Real Beardies" to preserve one of Britain's most distinctive breeds? Scroll down for "Double Standards"
When, in 1978, the American Bearded Collie Standard was altered to become not only significantly different from the British Standard but actually incompatible with it, I decided that I would not judge the breed in the United States again. At the time this was regarded by others as a silly over-reaction to the 'tidying up' of a few minor details, so when, twenty years later, a kind invitation from the National Capitol Club persuaded me to change my mind, I was intrigued to see whether my concerns had been groundless. Sadly, I have to say that they had not, but since the majority of exhibitors - and judges! - on both sides of the Atlantic, seem to be unaware of the importance of the differences between the two standards, I would like to raise the matter for discussion. On my recent visit it seemed that the greatest change had been in movement. The British Standard says "Movement should be supple, smooth and long-reaching, covering the ground with the minimum of effort." A good description of the easy, effortless Beardie action, and applicable at all paces. In the show ring only the trot is demonstrated and it is best shown at a moderate speed, certainly no faster than that at which the dog would trot naturally. If you watch your Beardie at liberty, playing, running free beside a bicycle, horse or jogger, you will see how readily he will break into a canter as speed increases. He will never naturally trot at the speed at which most exhibitors insist on trotting their dogs in the show ring. The American Standard has a separate section for gait and goes into much more detail than the British, but the important difference is contained in the first couple of lines: "Movement is free, supple and powerful. Balance combines good reach in forequarters with strong drive in hindquarters." What a different picture this presents. Instead of the energy-saving, tireless, easy Beardie action, we have "power" and "strong drive". No mention here of minimum effort - on the contrary, the picture is one of great energy and exertion. The aim of most American handlers seems to be to present their Beardies in the manner of a German Shepherd - flying round the ring at a speed which must be exhausting for dogs and handlers alike and which leaves the unfortunate judge quite dizzy. In some cases the dogs are strung up so tightly on a throat-cutting chain that their feet hardly touch the ground. Surely this can't be what is meant by the American Standard's ".......making minimum contact..." ! Another point on which the American Standard is in conflict with the British is on the matter of size. Although both give the same 'ideal height', the British goes on to stress that; "Overall quality and proportions should be considered before size but excessive variation from the ideal height should be discouraged." Whereas the American says; "Height over and under the ideal is to be severely penalised." Which means that the 'ideal height ' is not an ideal at all but an essential requirement. Any deviation must be severely penalised and the judge is not at liberty to apply the British principle that a top quality, correctly proportioned animal is to be preferred to an untypical or mediocre specimen which happens to be of the desired height. The American list of 'serious faults' which judges are required to 'severely penalise' goes against the British preference for leaving comparisons and priorities to the judge's discretion. The British Standard does not list faults at all, it being obvious that any deviation from the described ideal would be a fault. In most respects I believe the British Standard to be a good one. My unhappiness with the current British show scene is not to do with the standard but rather with the way that judges and exhibitors choose to ignore some parts of it, notably the important matter of coat length and density. How often does one see a show winner with "eyebrows arched up and forward but not so long as to obscure the eyes" ? In America this would in any case be regarded as a fault because the US Standard requires that: "The eyebrows are arched to the sides to frame the eyes and are long enough to blend smoothly into the coat on the sides of the head" So the British Standard requires that the eyebrows should not be too long , while the American Standard asks that they should not be too short. Which is odd when one realises that in other references to coat length the American Standard certainly emphasises the desirability of a medium length coat rather than a long one. The very first sentence describes: ".....a medium sized dog witha medium length coat......" Since 'medium length' is also used to describe the coat in the American Standard of the German Shepherd, it is obvious that almost all show Beardies are absurdly over-coated. If the modern show Beardie has a 'medium length coat' , I wonder which breeds would count as long coated. I was pondering this very question while watching another judge assessing a class of Beardies in the States, when two teenage girls stopped beside me to watch. "Just look at those furballs!" exclaimed one..."Aren't they cute?" Further to the "Cute furballs"...........in the BCC yearbook for 2005, a well known Beardie breeder who is also a championship show judge on the Club's A1 list, proudly described the dogs she breeds as ".....big bundles of excitable fluff." 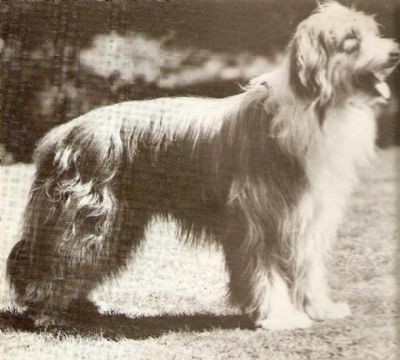 "Lynne took 'Characteristics and General Appearance' as her first two points of discussion and drew to our attention that whilst many of the breed characteristics such as expression, temperament etc., are emphasised in these sections, there is no mention at all of coat as being an important feature of the breed, except to say that plenty of daylight should show under the body. The Beardie should not be considered to be a ‘coated’ breed and she feels that too much importance is given to breeding for glamorous coats, in order to win in the showring. Fifteen years later, at an SCBCC ‘Education Day’ in 1998, I made the same suggestion, asking my audience to close their eyes and visualise their ideal Beardie – and then to consider whether the mental image was based on the Standard or on the current top show winners. My audience became increasingly hostile - especially when I suggested that brushes and combs should be banned from the ring. By the end of the afternoon it had become clear that the 'Beardie Establishment' would not accept that the modern show Beardie was anything but a great improvement on its working ancestors. This idea really shocked me : I fell in love with Beardies in the 1950s because I was enchanted by the dogs as they were. When, in the early sixties, I became a breeder myself, my aim was only to preserve these wonderful dogs. The notion of improvement never entered my head. And how could the transformation of a rugged, versatile working dog - equally suitable as a farm worker or family companion - into a showring dummy whose coat is so excessive as to be totally impractical for either worker or pet.......be considered an improvement?